If you have ANY questions at all for me, use the form below to submit them! What are the best macros for a cut? The best diet/macros are the ones you can stick to. If you force yourself on something you don’t want to do, how long can you actually sustain it? Do you use an app to track workouts? Does a notebook and pen count as an app? If so, that’s the app I’ve been using for over a decade! What is the most accurate way to track foods? Weigh them while uncooked or cooked because volume changes depending on cooking methods? Nothing is always going to be 100% accurate. Personally the method that I’ve always used is to weigh everything cooked and add an ounce or two to the final weight depending on the method I’ve used to prepare it and how much I’m eating. Another reason I use this method is because it’s just easier (especially if you’re eating out). As long as you’re consistent with whatever method you’re using it’s all that matters. What is in your opinion the best way to combine strength training and bodybuilding for better gains in strength and size? Both of these can go hand-in-hand, no? A lot of professional bodybuilders have only trained for strength and have been extremely successful. Personally and even looking at most of these bodybuilders now (tons have joint issues) I wouldn’t suggest training for strength all the time. The best way for me to combine both is to take into consideration my overall health. I train for strength but don’t prioritize it in every workout. I test my limits but don’t test them all the time. This might not be the fastest route to success but for me it’s the BEST and healthiest (I’ve never had an injury…knock on wood)! Will I be posting workout videos? Did you get fit training for strength or hypertrophy? Or maybe a combination of both? I started out training for strength originally but I’ve gotten fit doing all of the above. The key is to find out what works best for YOU and a combination works best for me! I have a personal trainer and he is actually the one who told me about you so I don’t need a workout plan but I do need a meal plan for me and my husband. Do you have any packages for just a meal plan? Short Answer: I try to challenge myself and progress every day. As long as fitness is there (the gym, a run, bike ride, etc) I’m going to be able to always do both challenge myself and progress in some way…every single day. It’s a free happy pill. As for when I realized this? The first time I went to the gym I couldn’t sit right on the toilet for a whole week. Can I eat your recipes and still lose weight? I get this question a TON! YES! YES! YES YOU CAN! It all comes down to how many calories you eat. Eat calories over maintenance = gain weight, eat calories under maintenance = lose weight…it’s that simple. Can I still grow muscle without taking protein powder/drinks? How often do you lift? How do you train your arms? It depends on what program I’m on but for the majority of my “career” I’ve trained them once a week on the same day. What’s your favorite body part to train? Toss up between legs and chest! What do you think is the best thing to do when fasting during Ramadan nutrition-wise? Bulk, cut, or maintain? I don’t think there’s a best option. Personally I love to eat huge meals so bulking wouldn’t be a problem for me but if you’re not someone who can take down a huge meal then that might be out of the question for you during Ramadan. I track my macros pretty closely so I was wondering how accurate the protein count is? As accurate as you can get! Which diet is the best to lose weight? The one you can stick with! My preference? Eating under maintenance + balanced macros. 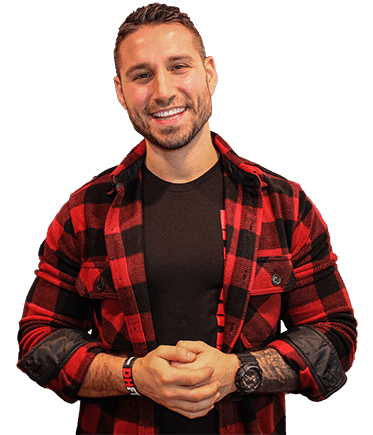 How can I gain muscle but not gain fat the same time? You’re always going to gain SOME fat when you go into a calorie surplus. The challenge/goal here is to gain as little fat as possible. To do this you need to gradually move into a surplus or “slow bulk” as some like to call it. Slow and steady! How do you come up with these recipes? All of the ideas come from cravings I get which tend to be more dessert driven (I have a huge sweet tooth). Once a craving hits I start with putting a healthy spin on it then do my best to get creative with it! Where is your low carb section on your website? Can a 16 year old start taking creatine? Personal Experience: I’ve been taking 5g of monohydrate off and on since I was 16 and have had no issues. What’s your take on pro hormones? Would I put under-researched gas inside a perfectly good Ferrari for a chance to go a bit faster until I run out and then possibly be slower after that? No, I wouldn’t. Your hormones, especially at a young age, are not something you want to mess around with unless you have a reason to (low T, old age, etc). Do you think it would be safe for a 13 year old to drink protein shakes? Protein powder is REAL food! 100% YES! Will cheap protein powders do the job as well as the expensive ones? This all depends on the ingredients in the protein powder. Look for fillers and lots of artificial ingredients. Keep in mind that there are plenty of bad expensive protein powders too. Are white potatoes considered a refined carb or are they a good source of carbohydrates? They are NOT considered a refined carb. White potatoes are a fine carbohydrate source! Can I substitute vanilla extract with powdered vanilla? Can I use stevia instead of brown sugar in your recipes? They have a brown sugar blend that would be much better! I can never find butter extract anywhere! Where do you buy it and what brand should I look for? Where I live they have it in all of my local grocery stores, Walmart, and so on. 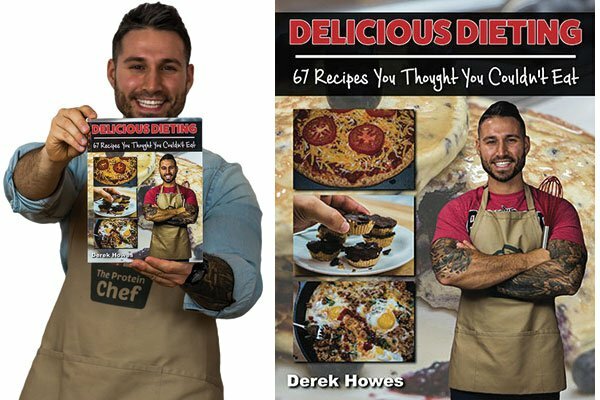 You can also buy it via my Ingredients page for cheap (it lasts forever): https://theproteinchef.co/ingredients/. The brand more than likely isn’t going to matter so I wouldn’t worry too much about that! Can recipes that use protein powder still work without protein powder? Most of the time, yes…but you’re going to have to tweak some of them a bit. Things like protein oatmeal, pudding, shakes, and so on will obviously just have far less protein. What is the best Greek yogurt substitute? Most of the time cottage cheese works great! Is there a substitute for the sugar free syrup? Yes! Honey, brown rice syrup (my favorite), and of course…MAPLE SYRUP! All of these choices will add more carbs/sugar to the recipe though! I am allergic to egg. 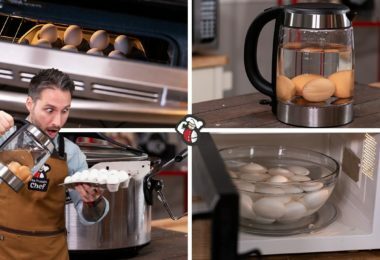 What would you recommend as a substitution to eggs in your recipes? Unfortunately it really depends on the recipe, there’s no real “one size fits all” for substituting eggs. I do however try and post substitutes as I try them for each of my recipes! At the moment, do you drink more espresso than regular drip coffee? If so, why? I am debating on making the switch because I worry the drip coffee is making me over-caffeinated. It’s about equal actually! Why? I like the taste of both and the convenience of a nice espresso shot. I’m super caffeine sensitive and rarely ever have any issues aside from jitters every so often. My suggestion would be to drink less or drink it over a longer period of time (my drip coffee will last me a couple hours). Nothing is worse than being over-caffeinated! Right this moment? Protein cheesecake! It really depends on what I’m craving though, I have a ton of favorite recipes! Do you ever just drink regular protein shakes? Between 170-190lbs (it depends on the time of year)! It depends on the day. Typically I eat 3 or 4 times a day but If I’m really busy sometimes I’ll only eat 1 or 2 meals with some quick snacks. To watch? Football, without question. To play? Baseball! New England Patriots. Still like me? What sort of training split do you use and over how many days? It really comes down to what my goals are that time of the year. Throughout the year I’ll train for strength, cardio, and so on. I typically make it to the gym between 5-6 days a week though! For the past decade+! Started on a notepad, then FitDay, and now MyFitnessPal! What’s next!? Why did you get tattoos and is there any story behind them? I’ll do a video on them someday (more than likely when I go to get my next one) but yes, they all do mean something to me. If it’s any indication most of my tattoos are angels of some kind. SUMMER! I absolutely HATE being cold! What’s your favorite work out music? Cardio? Anything dance/club though I tend to go for 90’s stuff (think Snap! – Rhythm is a Dancer). Lifting? Atmosphere, Outkast, Eminem, Florence and The Machine, Hozier, Stereophonics, John Mayer Trio, etc. MOOD DEPENDENT! Excluding Arnold, who is your favorite bodybuilder of all time? Arnold! Haha. I really don’t have a favorite. I always loved reading about/watching Tom “The Quadfather” Platz. Someone more recent, Kai Greene seems like a good dude and he’s fun to listen to. I will say aesthetically I’ve always like Frank Zane, Serge Nubret, and Lee Labrada! 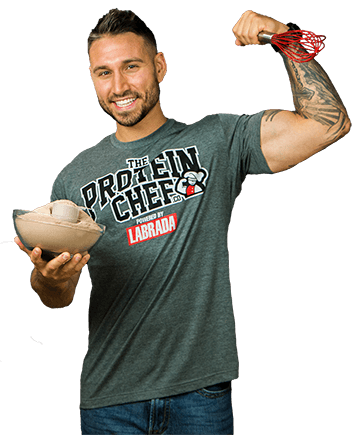 Ask The Protein Chef a question below! Thanks for answering questions Derek! Love your channel keep up the good work. I would love if you could make a recipe for crunchy cookies or a recipe of coconut (cake o cookie). Thanks! I meant coconut cake or coconut cookie. Or both! Why not haha. Your accent sounds like you’re from Arizona or something, not Boston. What’s the deal? Hey Matt! Haha, I’ve never lived in Arizona but I have lived all over New England. Maybe that has something to do with it?